The International Socialist League of South Africa was the earliest major Marxist party in South Africa, and a predecessor of the South African Communist Party. The ISL was founded around the syndicalist politics of the Industrial Workers of the World and Daniel De Leon. Formed in September 1915, it established branches across much of South Africa (excluding the Western Cape). While early attempts to recruit white workers failed, the ISL soon came to the attention of the young African National Congress, (then called the "South African Native National Congress") and several prominent early ANC members attended ISL meetings. By September 1917 of the ISL had helped to form the first black African trade union in the country, the Industrial Workers of Africa. While its founders were mainly drawn from the radical wing of the white working class, the movement would develop a substantial black African, Coloured and Indian membership. Following the Russian Revolution in 1917, the ISL became enthusiastic supporters of the Bolsheviks. Ivon Jones, co-founder of the ISL and editor of the league's organ The International welcomed the revolution with an article titled "Dawn of the World." The article calls the revolution "an unfolding of the world-wide Commonwealth of Labour, which if the oppressed of all lands only knew...would sweep them into transports of gladness." This enthusiasm for the Bolsheviks would ultimately lead the ISL to merge with several other socialist organizations to form the Communist Party of South Africa in 1921. The ISL became defunct following its merge into the Communist Party of South Africa in 1921 but, provided many notable early figures to the Communist Party. The centrality of the ISL in the formation of the SACP left a political mark on the party for years to come, and was responsible for a strong syndicalist influence on the early politics of the SACP. When the Industrial Workers of Africa, merged into the Industrial and Commercial Workers' Union or ICU, in 1920, it too spread the ISL's syndicalist ideas within that union. The ICU would go on to play a major role in rural South Africa, as well as spread into several neighbouring countries. van der Walt, Lucien, Bakunin's Heirs in South Africa: race, class and revolutionary Syndicalism from the IWW to the International Socialist League, Politikon journal, 2004, Vol 30, number 1, pp. 67–89. van der Walt, Lucien, The First Globalisation and Transnational Labour Activism in Southern Africa : white labourism, the IWW and the ICU, 1904-1934, African Studies journal, 2007, Vol 66, Issues 2/3, pp. 223–251. Bradford, Helen, A Taste of Freedom: the ICU in rural South Africa, 1924-1930. Raven Press, Johannesburg, 1987. Drew, Allison, Discordant Comrades: Identities and Loyalties on the South African Left. University of South Africa Press, Pretoria, 2002. Lucien van der Walt and Michael Schmidt, Black Flame: The Revolutionary Class Politics of Anarchism and Syndicalism (Counter-Power vol. 1), AK Press, 2009. ^ van der Walt, Lucien, Bakunin's Heirs in South Africa: race, class and revolutionary Syndicalism from the IWW to the International Socialist League, Politikon journal, 2004, Vol 30, number 1, pp. 67-89. ^ Hirson, Baruch. A History of the Left in South Africa: Writings of Baruch Hirson. London: I.B. Tauris, 2005. Page 45-47. ^ Lerumo, A. Fifty Fighting Years: The Communist Party of South Africa, 1921-1971. London: Inkululeko, 1987. 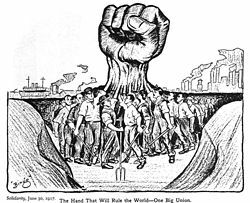 ^ van der Walt, Lucien, The First Globalisation and Transnational Labour Activism in Southern Africa : white labourism, the IWW and the ICU, 1904-1934, African Studies journal, 2007, Vol 66, Issues 2/3, pp. 223-251. This page was last edited on 29 September 2018, at 18:41 (UTC).